Twenty-five years after Ronald Regan made his famous demand in Berlin "Tear down this wall," Micron, Samsung and early hybrid memory cube consortium members promised to tear down the memory wall [ see IFTLE 38, "IFTLE 38 of Memory Cubes and IvyBridges - more 3D and TSV"], which was viewed as holding up the progress of future microelectronic products. Since recent IFTLE reports have indicated that delays in 2.5/3D commercialization have been due to a lack of TSV memory stacks (or at least TSV memory stacks at the right cost point) [see IFTLE 140 "Important Apple Rumors; Xilinx not Deserting 2.5D;Book to Bill Improving"], we thought it was appropriate to take a look at the current status of HMC. Updates on their progress can be found here [link]. ARM, HP, and SK Hynix joined former members including Micron, Samsung, Altera, IBM, Microsoft, AMD, Fujitsu, ST Micro, Marvell and Xilinx in June 2012. The group has recently issued version 1.0 of its specification for a vertical memory stack with a defined logic-layer interface. The group is reportedly changing focus to higher-speed variations of a DRAM stacked using TSV technology. They want to increase data rate across modules from the current 10 – 15 Gb/sec up to 28 Gb/sec. Micron said it will deliver engineering samples of 2 and 4 Gb versions of the stack by this summer with commercial production scheduled for late 2013 or early 2014. 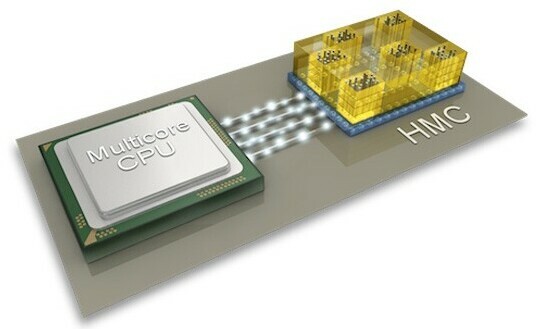 High-speed networking vendors will probably be the first to commercialize with HPC-centric applications next in line. Initial HMC implementations will be DRAM, but multi-memory stacks that employ NAND flash and DRAM are expected to follow.[link]. 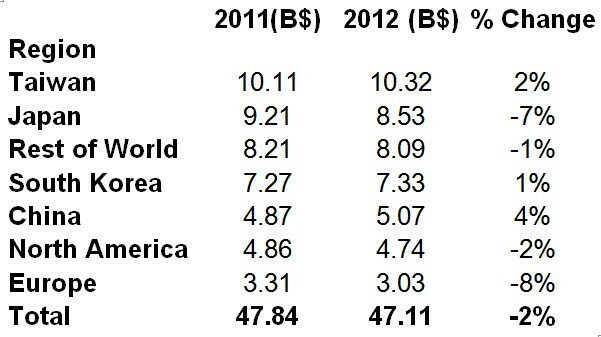 Gartner reports that total worldwide semiconductor revenue was $299.9B in 2012, down 2.6 percent. The top 25 vendors accounted for almost the same portion of the industry’s total revenue as compared to 2011. Intel retained its number one position despite a 3.1 percent revenue decline (due to decline in PC shipments). Number two Samsung saw weak DRAM growth although its overall revenue increased from smartphone ASICs and application-specific standard products. Qualcomm, which climbed to number three, continues to benefit from its leading position in wireless semiconductors. Texas Instruments retained its fourth-place ranking, although Toshiba slipped to fifth place in semiconductor shipments. Semi just reported that the global semiconductor materials market decreased 2 percent in 2012 to $47.11B the first decline in three years. Packaging materials exceeded wafer fabrication materials for the first time ever $23.74B vs $23.38B. For the third year in a row, Taiwan is the largest consumer of semiconductor materials due to its large foundry and advanced packaging base. Materials markets in China and South Korea also experienced increases. The materials market in Japan contracted 7 percent, with markets also contracting in Europe and North America.